Recommended Leader - 200-300lb or #10-15 wire for wahoo. Eye Dropper Bullet Heavy Heads are straight tracking and designed to run over Select or Horse Ballyhoo when targeting large tuna and wahoo. 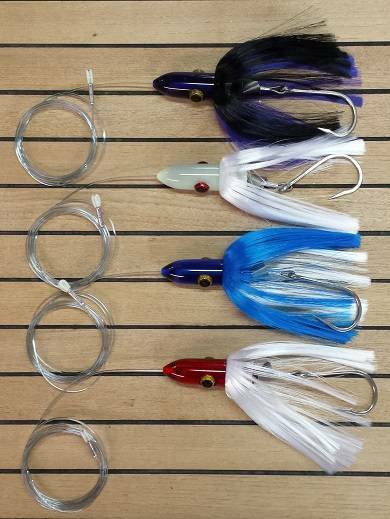 The Eye Droppers are extremely versatile, and can be pulled anywhere in the spread, in any sea conditions, and at a wide range of trolling speeds. The tinted resins also include UV additive, and unlike painted lead-heads, will not lose color due to chipping or scuffing. Each lure is rigged with a 9/0 Southern Tuna style hook, 8ft of Momoi 250lb test mono, stainless chaff gear at the hook end, and a nylon thimble at leader end. A stainless spring and pin are also added for ease of rigging.